SCINDIAN MAGIC....No horse has done more to help in the fulfilment of the Arab Horse Society`s second declared object "to encourage and re-introduce Arabian Blood into English Light Horse Breeding"
Yes I think he did Libby. His jockey was generally a retired pro jockey called Clive Chapman. He was also the guy from the Hamlet advert where all the horses came out of the starting stalls but his, so he lit a Hamlet...he taught me to ride in a racing saddle (and fell off my pony)!! he raced successfully too, eh? 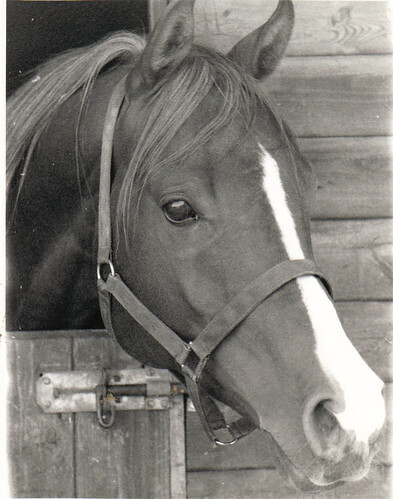 Scindy was 16.00 hh 75% Arab and 25% Thoroughbred. 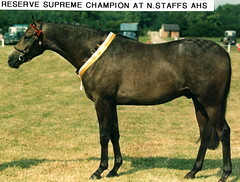 She was a Champion Brood Mare and bred eleven Anglo foals for us. bnabsr- oscar- what a lovely horse!! Alsion Hardcastle, who owned Scindian Magic, was a believer in 'doing' horses - her other stallion, Shifari ,was also an exceptional performer who point-to-pointed amongst other things, and whose daughters were bred to Scindian Magic deliberately to establish a line of talented performers. My horses are all descended from Dr June Alexander's Scindian Magic daughter Scindy, who also had Shifari in her lines, and as well as being a notable performer herself, has produced a line which continue to be 'doing' horses. It should however be noted that Scindy's dam line is that of the important performance mare Belka through Dil Kushi - who as well as being an outstanding broodmare was also a hunter and a riding school 'pony'!. 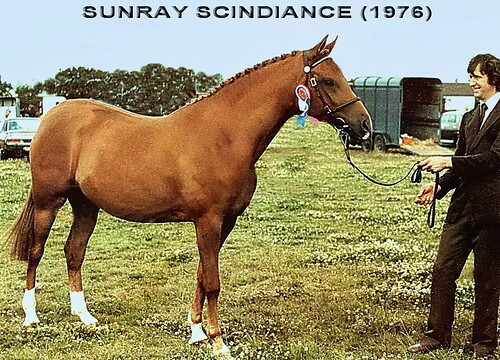 In short, I think a lot of Scindian Magic's success is down to the intelligent way he was used on good mares by a very knowledgeable breeder who passionately believe that Arabs were performing horses! Was Scindian Rajkumar sired by Scindian Magic Anna? I used to ride a stallion trained by Karen Seers, many years ago, he was Scindian Rajkumar, I often wonder where he went, he was my favourite during my time there. Her Grand-dam is Sunray Bred on both sides of her pedigree. 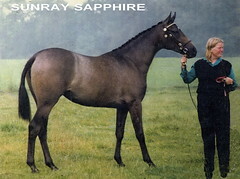 Wrenthorpe Stud, purchased Sunray Sapphire and bred her back to our stallion several times. We later purchased her Son ( full blood to Wrenthorpe Rhapsody) as my OH riding horse, as he is 16.2hh and Tony 6`3" (Oh how I wished this boy was a mare)!! So, Brox Lady Arabella carries Scindian Magic bloodlines. 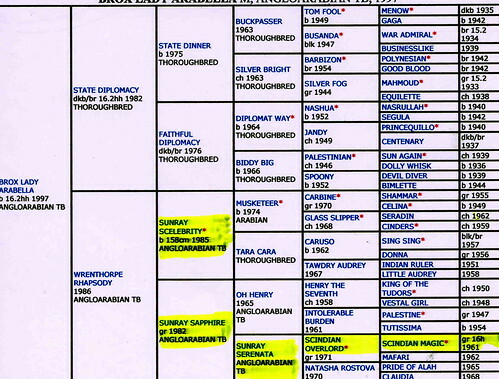 She is one of only two Anglo Arab mares ever to have been graded into the Trakhener Stud book. 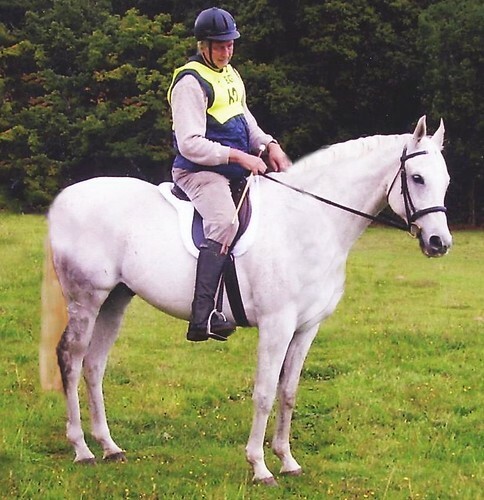 Nicky`s great Anglo and Graded Trakhener Stallion, Fairlyn Gemini with his Oran bloodlines.....what a super match with Arabella and what an Anglo and Trakhener Performance Stallion we would have! !......but so far, Arabella has only produced fillies to him. I swabbed Olympus Cherokee Chief ready for the breeding season last week, he is a lovely horse and a real gentleman. I was unaware that he is out of a Scindian Magic mare but am unsurprised to read this as I particularly like him! Its incredible how often when a horse really takes the eye/heart, even if you are unaware that he or she carries Arab blood, scratch the surface and the same old classic lines are there. to all you breeders breeding performance Arabs and safeguarding this blood. PS he is of course by Fleet-water Olympus ! gap included to avoid shocking the computer with bad language Denmoor! Olympus Cherokee Cheif was Sired by Flee****er Olympus, it was the dam line who carried the Sindian Magic bloodline, this demonstrates a point that you were making Babs, and I agree the dam line is just as important as the Stallion.